The Nike Vandal released in 1984, 2 years after the Nike Air Force 1 and it’s increased collar height, stability strap, canvas upper, and pivot-point outsole made it one of the top basketball sneakers of the time alongside the Nike Dunk, Nike Terminator, Nike Legend and the Nike Air Ship. Production did not stop until 1987 and although it was a basketball shoe, the Velcro fastening and sleek design had B-Boys and skaters wearing them. I prefer sleeker high tops from the time like the Vandal and the Air Jordan 1 to the Air Force 1 because of the toe box shape and sleeker silhouette. John Elliott Co, based out of Los Angeles, makes some of the best luxe menswear essentials but this collaboration isn’t just random. 27 years ago, 8 year old John sent letters to Nike with his design sketches that they actually replied to at the time. Fast forward to 2017 and Nike gave him the opportunity to work on a shoe and he picked the Vandal because it was a sneaker he himself wore in the Dunk crazed 2000s. What makes this a very special sneaker is the fact that it is a true amalgamation of the ethos of both brands, Nike providing a canvas onto which Elliott has projected what he does best – providing premium updated classics in minimalist color combinations with details that aren’t visible at first glance. 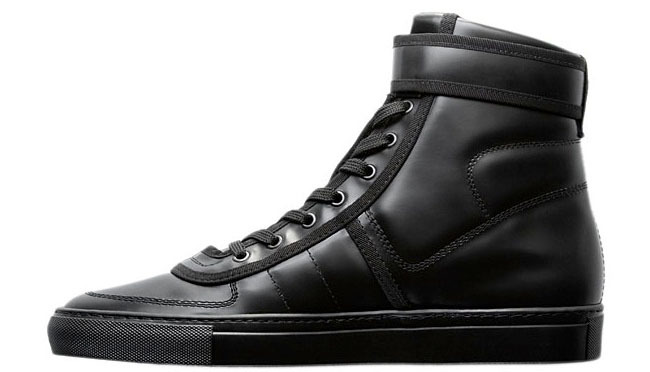 Raf Simons ‘Vandal’ High – More proof of the Vandal’s cult status. The suede on these is quite premium and in line with John Elliott Co’s clothing while the color keeps it quite approachable. Grey goes with almost everything! Rolled seams give the sneaker a more modern and cleaner look overall. The tongue, heel tab, John Elliott branded insole and Nike branded strap pulls are rendered in a supple debossed leather. Three exchangeable straps, including a reflective one, are part of the package so you can mix and match. Another look at the suede. The layered swoosh from the original stays on. Overall, the Nike x John Elliott Vandal High is a very clean sneaker that’s easy to throw into your rotation irrespective of the way you dress and if you are a fan of the sneaker, John Elliott has more kicks coming with Nike in 2018, so stay tuned.